We had family visiting over the weekend and so instead of cooking we went out to dinner every night. When they left yesterday, I decided that I wasn't going to the grocery store and would make something for dinner with whatever I had in my freezer and pantry. So I decided to make a Herb-Crusted Caesar Salad Sandwich. 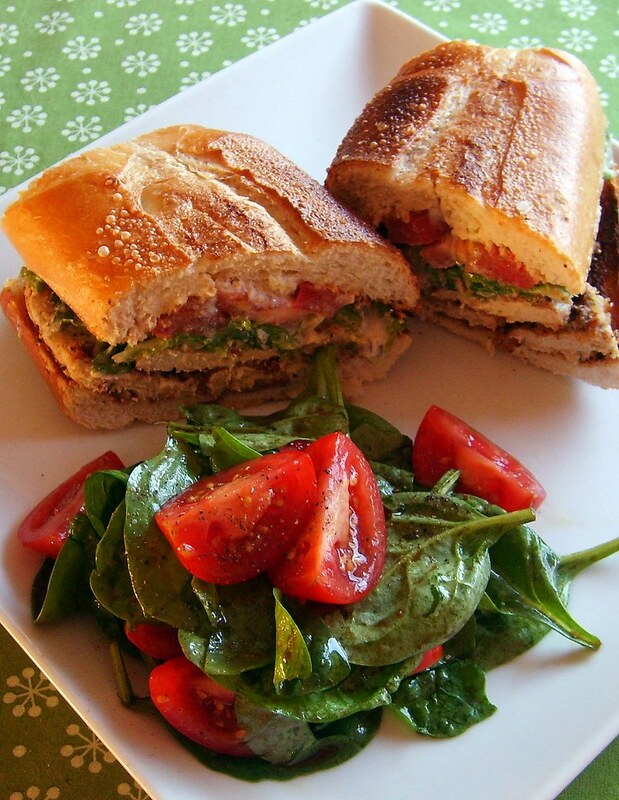 I used Gardein Chick'n Scallopini because that is what I had in my freezer, but this sandwich would be just as good with herb-crusted seitan, tempeh or extra firm tofu. Going out to dinner in the South Bay is a bit of a drag when you're vegan. Unless you want to eat greasy fried Asian food, falafels, or vegan pizza, your options are really limited. I wish we had better restaurant options here. The next time I have family visit, I'm going to cook at home instead of going out to dinner. At least I know that my food is healthier and definitely a lot better tasting, and my kitchen has a lot more options to choose from! Note: Depending on how large your sandwich rolls are, you may need to purchase two packages of the Gardein. Each sandwich uses about 1-1/2 fillets each. Remove scallopini from freezer and defrost in microwave until softened. Cover with plastic wrap and press lightly with the palm of your hand to increase size a little bit or roll lightly with a rolling pin. Mix bread crumbs with herbs and spices in a bowl and set aside. Working one fillet at a time, brush lightly with vegetable stock on both sides and dip in bread crumbs and press lightly to adhere. Set on a baking sheet until all pieces are coated. Heat a saute pan on medium heat, add canola oil and fry until golden brown and crispy on both sides, about 4 minutes each side. Set aside. Prepare Caesar salad dressing and set aside. Prepare herb-crusted fillets and set aside. Chop lettuce and toss lightly with Caesar dressing, add salt and pepper to taste. Toast sandwich rolls and smear both sides with a little dressing. Slice fillets in half or in strips and place on bottom half. Top with dressed lettuce and sliced tomato. I served mine with a side salad of baby spinach, tomatoes, and balsamic vinaigrette. Delicious!